We have whooshed around ~ mmm, no, I don't think we made any turns around anything on our way here this week. This week we whooshed straight to Friday! I'm parched we went so fast that time! I am here with another Friday DJKASE for your reading and inspirational pleasure! I'm not gonna lie, I was really anxious about the day when this card artist's name came up in the draw, but I admire her too much not to try my hand at copylimenting her. I'm speaking of the brilliantly talented Ms. Anne Redfern of Redanne. Anne has been blogging since 2012. She is an award-winning designer. She is known far and wide for her meticulous and outstanding creations and her love for Tim Holtz and All Things Tim. If you ask me, Mr. Tim should be PAYING Anne for her enthusiastic promotion of everything Timish. Distressing, embossing, masking, cutting, wiring, painting, spraying, dieing, stenciling, pasting, alcohol inking ~ wait, what? I don't think there is a technique alive that Anne can't acomplish precisely and perfectly. Here is a photo of the lovely lass. She is every bit as sweet and kind and generous as that pretty smiling face would indicate! It has been a true pleasure becoming her friend in Blogland. But you know me, I love a challenge and luckily for me, there are a few of Anne's works of art that are within the limits of my capabilities. I chose this tag of Anne's to DJKASE, which also happens to be perfect for this time of year. Anne posted it about a year ago on March 28, 2013. I think it is so fun for spring! I don't have a bunny die or punch, so I used a label die to make the center tag and then I ran it back through my BS using another small label die to make the opening for my Easter-basket-pink grass. I covered the openings with clear acetate and glued the two cut labels together on three sides. Then I stuffed the grass through the opening and glued it shut. That label was then attached to the pretty pink and shimmery tag and the rest is pretty self-exploratory. All the ingredients are listed below. The ribbon is a white ribbon that I swiped with a turquoise ink pad. Annie, my friend, I know it's not inky or Timspired, but I do hope you are pleased with my DJKASE tribute! [I just noticed that I forgot to add a lovely pearl or charm like you so often do. Shuckiedarn! I did mean to add one, but it's dark o'clock now so it's too late for this post.] Thank you so much for following me, for your friendship, and for your consistent encouragement through your sweet comments! I appreciate you very much!! Mwah! 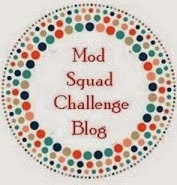 The "Spring into Spring" challenge at the Mod Squad Challenge Blog. 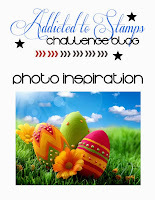 The "Happy Easter and/or Sweet Treats" challenge at the Simon Says Stamp Wednesday Challenge. The always fun Pixie's Snippets Playground where the only requirement for joining is that you use a snippet (scrap) on your creation! Playing at Pixie's has been a wonderful reminder and has helped me form the habit of checking my scraps first. Besides, all the people who enter the Playground are ungrown adults and those are my kinda peeps. As always, just click on the links of any of the challenges to find out the details about rules, sponsors, and prizes. Besides introducing you to the amazing Anne, if you haven't already had the pleasure of meeting her, I'm tickled to introduce you to these new friends. I give you fair warning to stop now and refill your beverage! Donna of Indiana Inking. Donna has been blogging since 2008! Every time I find someone who has been blogging that long, I think HOW did I not know about Blogland and this wonderful stamping community back then?? I had no idea all that inspiration was out there! It's okay, there is no time like the present. You will love visiting Donna and catching up with her! Manuela of Elasdistrict. Manuela is from Germany and she has been blogging since 2010. She didn't blog often until this year and it's been wonderful to see more of her delightful posts and cards. Besides making cards, Manuela enjoys baking and gardening and she is a frequent contributor to many card challenges. Susanne of Snaps and Snippets. Susanne is another blogger from Indiana who has also been blogging since 2008. (Do Donna and Susanne already know each other?!) Make sure you check out her "Studio" tab! Susanne is a crafter after my own heart with her amazing space and organizational skills. I think she also has my version of OCD: Organized Crafting Disorder! You will find tons of inspiration and thoughtful advice awaiting you here. Shirley of Card Art, Etc. Shirley is another card artist who has been blogging since 2008! Shirley's blog is a wealth of information and inspiration as she shares all her knowledge with her readers through her posts and tabs. You will find Shirley's card art is impeccably designed and executed, outside and in! Leslee of Canadian in Montana. Leslee has been blogging since ~ say it with me ~ 2008! (I sorta feel like I'm being punked! jk) Leslee's blog is a fun reflection of her life with her family. She is an avid scrapper, family photographer, and card artist. Given her location, Leslee's fantastic cards are often beautifully scenic. Once again, loads of inspiration! Thank you so much for joining, ladies! Welcome to the Playhouse! Accessories Dies: My Favorite Things "Tag You're It" and "Well-Worn Greetings"; Simon Says Stamp "Folded Banner"; Poppy "Grassland Border"
Hi Darnell, I love your version of Anne's tag, the colours are so pretty and perfect for this time of year. I'm an avid follower of Anne's blog too .... I love her vintage style, and she's one clever lady! Hi Darnell - your CASE of Redanne's work is brilliant. Happy Friday to you and wishing you a wonderful weekend. I love your project - so cute, and Anne's tag is fab as well. Thanks so much for the shout-out. I didn't know Donna of Indiana Inking, but I will (wink). Leslee and I go way back in reading each others blogs, not all the way to the beginning but back a fair while. It is good of you to encourage visiting others' blog like this, I think it went out of vogue for awhile - great to see that active encouragement again. I am so pleased to see you CASE the lovely and extremely talented Anne, I agree with you - her designs are stunning and so inspiring. I love your tag, a gorgeous selection of colours and textures with such a beautiful flower. I LOVE your CASE of Anne's tag Darnell! Naturally I adore the pink :) Thanks for coming to play - I wanna know WHO you think is a real grownup in the Playground huh?! It's fantastic! Great CASE of the tag and love the flower and those tiny eggs tucked in the grass. CUTE! Wow Darnell, I cannot tell you how shocked I was to see my picture come in my blog roll!! You really are the sweetest and best friend anyone could have. Thank you for showing me in such a wonderful light, for saying such lovely things and for Casing me too, it is such an honour and I am so thrilled! Hey Darnell - you have spotlighted one of the sweetest bloggers I know. Yes she is extremely talented but her heart defines who she is. A wonderful friend and artist. I see my friend Sarn follows you too!! I do subscribe to your blog but it does not always come in my box. I have loved your craft play house forever and am pea green with envy!! Your tag is fantastic - not sure how you created the middle but I found it so yummy looking - just right for an Easter basket. Now I am going to have to go back and re-read your post!!!! WOW Darnell, this tag is just gorgeous. I love all the detail in it, especially the grass. Wow, Darnell! What a fantastic CASE of Anne's tag! Love the trick of making an acetate pocket to put the Easter grass into! So simple, yet so brilliant! TFS! It is gorgeous, Darnell! I love how you cased the beautiful tag! Darnell your Easter tag is just as CUTE as can be!! Love Anne's adorable tag too! You did a fantastic job CASEing Anne's card. I love the pink basket grass and the eggs in the green grass. If those gals have been blogging since 2008, I'm surprised they are just finding you. But then again, there are SO many blogs out there you can never find them all. I enjoyed reading about Anne and will be stopping into admire her work. As for your ta? AWESOME!! sweet and so bright. LOVE your sweet tag, Darnell! Great CASE of Anne. Off to check out her blog now. It definitely isn't Timish at all, but it is all Darnell and that's fabulous! Great colors and I get such a happy vibe from your tag. Great job! And I understand the intimidation factor when trying to CASE Anne. Hi Darnell...I just love your tag, especially the schtuff inside the frame...super original! You keep me hopping with your shout-outs to other bloggers. And a big thanks for commenting on my posts/cards. I don't get many, sp it is truly appreciated. I love your beautiful Easter tag. So lovely with all the elements you added. Darnell...this is one sweet little Easter tag, just as cute as the one you are cas'ing. Enjoy your weekend and see you soon! Di posed a questshun about whose the grown up in the playground but that has gotta be me cos I'm the only one tall nuff to reach the telephonic key paddy to call the fire brigade out!!! Ask me how I nose!! Your tag is super duper spit of Anne's. I think there is also an uncanny likenss to your two photos. Ok so the hair colour is different and the parting is on the other side and use have glaases sop maybe not the same at all. You have totally captured Anne's style in your tag! Great selection of elements that work perfectly together...just like Anne's projects! Love the pink Easter grass and the altered color ribbon that looks so good with the same color Happy Easter sentiment! Awesome CASE! Oooh, you chose a doozy to DJKASE Dippy......how brave! But you've pulled it off with the greatest panache! Gorgeous tag, lovely colours, you've definitely done yourself proud. Darnell, how lovely that you have DJKASED Anne, she is truly a talented artist and it is through seeing her fabulous work and her kind encouragement, that tempted me to dip my toe into this form of creating. Your take on Anne's lovely tag is perfect, the colours are so fresh looking and perfect for spring/Easter. I think Cadbury's will soon be in touch with you to use your design for their Easter egg box's next year. WOW! You did an amazing CASE of Anne's tag, Darnell! I love how you filled your label die cut with grass...how fun is that! Loving the spring colors, too! You have surely made her proud!!! Great case of Anne's beautiful tag...Hope you have a great weekend! I love your tag from the turquoise ribbon to the eggs peeking from the grass! A wonderful CASE! Your version of Anne's tag turned out so pretty!!!! I just love the Easter eggs! Great job!!!! Loving your case of Anne's tag. Such a sweet scene you have created. Great take on Anne's style! I remember that tag she made. Your version is great! You know, Darnell, when I saw that I have missed 11 of your posts over the last two weeks, I thought I was not going to comment on them all, but there I find myself WANTING to comment on them all as I went along!!! Such fun visiting you and enjoying your lovely sense of humour!! Thanks for always putting a smile on my face!!! Your tag is soooo beautiful!! I'm off to visit Anne's blog now!! PS. Always when I find myself way behind on blogvisits I promise myself not to have that happen again, but next time the same thing happens as I get as lost in knitting and crocheting as in card making!!! Will try and stay up to date for at least a while now!! Have a super weekend and greetings from Africa!!! Your CASE tag is great. Using the label die is so clever. Your tag is cute - love the colors and embellishments. What a wonderful CAS of Anne's tag! I love those vibrant spring colors! What a darling tag this turned out to be! Fabulous DJKASE of Anne's card, Darnell! I haven't made many tags, I find it difficult to decorate such a small space, but this is very inspiring! Great CASing of Anne's tag. Will have to check out her blog. Super surprised to see my face on your blog- thanks for the kind words! And Suzanne and I have been following each other for a while now. Hope you are enjoying a wonderful weekend. Very rude of me not to swing by earlier but my tablet was being naughty and not letting me comment/follow. Very cute Easter tag. Love how the eggs peek out behind the grass. I love your take on that fabulous tag Darnell, and thank you for pointing us over to Anne's great blog. Some of her gorgeous work makes me feel so inadequate, but is really inspirational. Hi Darnell love the tag design. Another lovely creation Darnell, I can see where the inspiration came from but you made it all your own and it's great. Darnell, your case of Anne's tag is awesome. Love the acetate and grasses. Anne's work is gorgeous and a great choice. Each project is just beautiful and so creative too!! That tag is SO adorable, Darnell! I love how you filled your window with Easter grass--how fun is that??? Gorgeous tag, Darnell! I love how you were inspired by Anne. Thanks so much for playing along with the Simon Says Stamp Wednesday Challenge: Happy Easter or Sweet Treats! Love your case, Darnell! This is such a great idea you came up with--fun to see each one! Cute tag Darnell! love how you added the grass.